I am a fan of cyberpunk (Bladerunner, Tetsuya Nomura stuff, BLAME! manga). It is a science fiction genre noted for its focus on “high tech and low life”. Another favorite style that is more widely known is steampunk. Many anime such as Last Exile, Steamboy, and Steel Angel Kurumi all fall under steampunk. 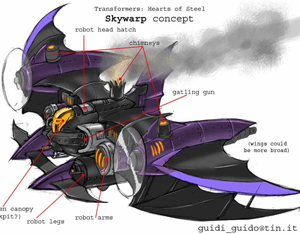 Well now writer Chuck Dixon and Transformers artist supreme Guido Guidi are creating a mini-series called Hearts of Steel, a steampunk take on Transformers. The bots have been transported to the Industrial Revolution and are fighting while running on steam. One thing I wonder is this: in the old series they fought over the oil derived Energon. What are they fighting over in this? Water? Steam? Coal? Get it at IDW Publishing. Here is a comedic look at some products that really shouldn’t have even entered someone’s mind and sadly I think some of them might have been made on some scale of production. 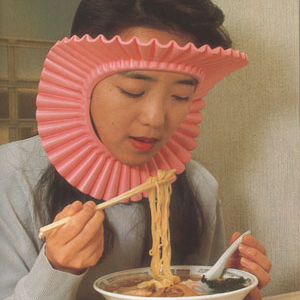 See some of Japan’s shameful inventions.